Before you say “NO WAY”, just hear me out. OK, it’s a little hard, but not really. If you’ve never done it before, learn a few tips, and then you learn by practicing. And here’s where little kids come in handy. They don’t really care if it’s not quite right. I have given all of my boys all of their haircuts since they were babies. I started learning on the first one, and got better with time. Now, I have four whose hair I cut every 2 months or so. Play video in front of child. This helps him sit still and not try to watch what you are doing. Spray hair with warm water. Using a fine tooth comb, hold a section of hair up between your second & third fingers. Cut desired length. Repeat, cutting section adjacent to already cut section. This is how you make sure it’s the same length. On the top of the head, make sure you go front to back, and on the sides and back of the head go up to down. Otherwise you end up with stripes. (ask me how I know). I’m sure there are some video tutorials on YouTube; at the time of this post I didn’t have time to look for one. But I will add one later on if I find a good one. I had NO previous experience. Really. And I make a few mistakes now and then, but not too bad. Honestly, it’s not that hard. I think the hardest part is to be willing to do it, to believe that you can, and to not be afraid. I always found this little rhyme at least moderately amusing. It makes me giggle even now. I haven’t shared it yet with my guys because I just know they will probably not stop saying it & then collapse in hysterics. But, they are boys, after all, It might be time to teach them about armpit “honks”. Crass, yes. But some things are just funny. Beans are extremely nutritious. See bean nutrition facts here. Beans, when combined with rice, provide a complete protein. Many Latin American countries rely on this combination for most of their dietary needs. When I was little, I’d see movies or commercials that showed little girls running through the sheets that were hanging out to dry. It looked like so much fun & I asked my mom why we didn’t do our drying like that. She basically said that only “poor” people dry their clothes that way and that it didn’t look nice to see laundry hanging. And I saw that she was right; in our neighborhood nobody would do such a thing, but driving into other sections of town we could see their laundry hanging. I just accepted it as the way it was and went about my business. Until I moved to Israel. Here, hanging laundry is the socially accepted norm. For years I couldn’t fathom hanging it every day like my neighbors and didn’t like the way it looks. Then one summer my dryer broke. And I hung all summer long, until the rainy season began (winter here), and we prioritized the dryer repair. But I’ve been thinking about it again, and a few weeks ago I decided to start utilizing this (free) power we all have-the sun, to save on electricity (translate: $$$). Good for the environment, good for the pocket, I’m happy. It does take more time to hang the clothes and bring them in than it does to load and empty the dryer, and that has been my main objection. However, I have decided to enjoy those few minutes outside by myself as a little break. All moms need that! And as for the way it looks, I hang it out on my roof deck where it doesn’t show-not to the neighbors; it’s out of my view as well. But twice a day I have a reason to stand and look at my gorgeous view of the Judean hills. (That’s my laundry and my view) Nice! I do one large load every day (keeps Mt. Washmore away), plus a load of cloth diapers. My drying rack holds only the one load; for now I’m still using the dryer for the diapers or if I need to do more than one load. Another drying rack or a line would solve that problem. I’ll get there. Babysteps. 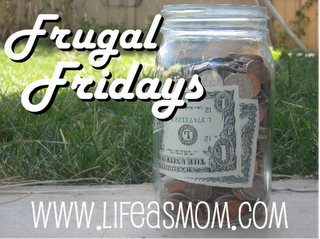 For more Frugal Friday ideas visit LifeAsMom. For more about saving electricity, visit this site.